Irish citizens Lisa Smith and Alexandr Bekmirzaev. THE GOVERNMENT HAS acknowledged that the return of Irish people who joined foreign terrorist groups in areas of conflict is a difficult, complex and unprecedented situation. The issue is in sharp focus since the discovery in a Syrian camp of Lisa Smith, a Dundalk woman, and the capture of Alexandr Bekmirzev, a man who holds Irish citizenship. Now that the Islamic State group has been defeated in north-east Syria, the return of Irish citizens from the war zone is not just a discussion, it is becoming a reality the State will have to deal with. The Kurdish-led Syrian Democratic Forces (SDF), supported by the United States, have now driven Islamic State fighters out of their last enclave at the village of Baghouz. During a two-week humanitarian window to allow civilians out of the area before the Kurds move in, more than 10,000 people left Baghouz and went into SDF territory. This included the wives and children of jihadists who are now in camps in this northeastern region. TheJournal.ie explored the topic in its most recent episode of The Explainer, where along with experts in deradicalisation, the podcast team examined what is possible in an Irish context. With the fall of the Islamic State in Syria, the entire world is having to make decisions, not least Ireland. The approach to any return of citizens who may have been fighting or non-combatant members of the Islamic State group will involve many arms of the State. So far the government here has said Irish citizens in Syria have the right to return home. When speaking about Lisa Smith’s case, Taoiseach Leo Varadkar said it will not be “as simple as coming here, and everything proceeding as if nothing had happened”. However he said the government does not believe that removing citizenship from a person and leaving them Stateless is the “compassionate thing to do”. The Department of Justice told TheJournal.ie that the return of persons suspected of having been active in Iraq or Syria “presents complex challenges, including questions of public protection, the prosecution of offences, the protection of citizens’ rights and deradicalisation”. And it said none of these lend themselves to easy resolution. “The question of how accountability can best be achieved for the people of Iraq and Syria who have suffered at the hands of ISIS is a complex one, facing not just Ireland, but also EU counterparts and other international partners,” it said. Whether it is possible to secure prosecutions in Iraq and Syria, by local means or by an international mechanism, is open to question. Whether it is feasible to secure prosecutions in the home states of foreign fighters is also open to question given the difficulty of securing evidence. The department said if fighters do return and there is evidence they committed terrorist offences, they will be fully investigated with a view to prosecution. The Criminal Justice (Terrorist Offences) Act 2005 provides that the Offences Against the State Acts can apply to any terrorist group as if it were an unlawful group. This would allow for a conviction if the authorities here could prove a person was an active member of the Islamic State group while they were living in Ireland – and it carries a prison sentence of up to 10 years. Gardaí have in recent times also arrested a number of people suspected of terrorist financing. Specialist garda units are working with Irish banks to stop money being laundered and filtered through Irish institutions. In cases where a person has joined Islamic State after they left, it is less clear. There is an EU directive on combating terrorism that makes it an offence to travel to a third country to conduct terrorist acts there, but we have not fully adopted its provisions yet. The main difficulty for the gardaí in all of these cases will be obtaining the evidence needed to secure a prosecution. Around 50 people are believed to have left Ireland to fight in the Syrian civil war – at least 30 of those on the side of Islamic State. Gardaí have said they believe the majority of Islamic extremists who left Ireland to fight in Syria or Iraq are either dead or missing. The authorities here are aware of a small number who have already returned under the radar – these are not people who were being held by Kurdish forces like the recent examples we have heard of. The figures are believed to be in the low double digits and they are being monitored. The most recent high-profile case involving an Irish person has been that of Lisa Smith. She has been captured by Kurdish forces in the north-east of Syria. She left Ireland in late 2013 and went to Tunisia where she met and married a Muslim man from Britain. It is reported that she became more radicalised there and by 2015 had travelled to Syria. An ITV news crew recently spoke Smith, now in her late 30s, in a camp in northern Syria where she is currently living with her two-year-old child. Her husband was reportedly killed a number of months ago. She said she had gone to Syria after seeing Islamic State propaganda videos. “You want Islam, you want to come, you want to live in a Muslim country…no music, no smoking, no drinking, no prostitution, anything like this. You want a clean life like this,” she said. Before the news about Smith broke, there was another Irish citizen in Syria under the spotlight – Alexandr Bekmirzaev. He is 45, originally from Belarus and he came to Ireland in the early 2000s. He married a woman here, they had a child together and he obtained Irish citizenship in 2010. It is believed he was radicalised by a Jordanian man while he was living in Ireland. He was put on a watch list and monitored by members of the garda Special Detective Unit. In 2013 he left for Syria with his family. He is currently being held by the Syrian Democratic Forces. There is also an Irish citizen in prison in the United States for terror offences who wants to be able to return here after he served his sentence – that is Ali Charaf Damache. He married an Irish woman in 2003 and now holds both Irish and Algerian citizenship. While he was living in Waterford he was wanted in the US, accused of being the ringleader of a jihadist cell that was plotting attacks in Europe and southern Asia. There was an attempt by the US authorities to have him extradited from Ireland but he fought that successfully. In 2015 he was arrested when he travelled to the Spanish city of Barcelona. Police there said he was plotting with a number of other individuals to kill Lars Vilks, a Swedish cartoonist who had drawn caricatures of the Prophet Mohammed. 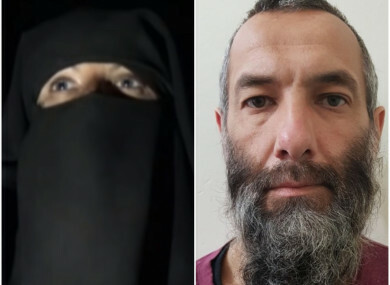 He was reportedly in the same terror call as US citizen Colleen LaRose, also known as Jihad Jane – Damache himself was known by the pseudonym ‘The black flag’. He was handed over to the US authorities in 2017 and is currently serving a 15-year sentence in a maximum security prison in the US. Once his sentence has been served, he will either be extradited to Algeria, or to Ireland. In the case of British teenager Shamima Begum, the UK took a hardline approach. She had left England at the age of 15 to join the terrorist group. When she came to public attention, she was pregnant and living in a Syrian refugee camp. She said she had already lost two children and wanted to have this baby in England. After a heated debate in the UK, the Home Office decided to revoke her British citizenship. In Lisa Smith’s case, this would not be an option because she only has Irish citizenship. The government here has signed up to a United Nations treaty which states the right to a nationality is a fundamental human right, so we have committed to never leaving a person stateless. But in December, Charlie Flanagan decided to strip Ali Charaf Damache, the man who is currently in prison in the US, of his Irish citizenship on the basis that he broke the oath he took to declare fidelity to the Irish nation and loyalty to the State. This is the first time the State has moved to remove citizenship from a naturalised resident. He is challenging that in the courts, arguing that if he is sent to Algeria after his sentence is served he may be tortured or killed. Reviews of decisions on the revocation of at least another 30 people are pending. Dundalk Imam Nooh Buye told TheJournal.ie that there was anger in the local Muslim community when this news broke that a woman from the local area had been exposed as an Islamic State member. They resent the way Islamic extremists portray their religion. In Islam, if someone has done wrong, a person also has to be helped to see the right path and so they can think again and change their character. Maybe if she had sought guidance from leaders in the community maybe it would not have gone this way. It can be a lesson to others not to fall into the same problem. Dr Ajmal Hussain of the School of Social Sciences in the University of Manchester said a sensitive approach is required if deradicalisation of Islamic extremists is to work. One thing I have found from speaking to people who have either been imprisoned under anti-terror laws or who have returned from being abroad is that they don’t want to be known in public. He referenced the “huge backlash” after Shamima Begum appeared on television and reports of people using a picture of her face in a shooting range. “Returnees or people who have been convicted and now released they want to play a low-key role,” he said. There are groups and there are individuals who are actively engaged in deradicalisation work. One, by supporting materially the needs of these people in terms of coming back into society and just needing a place to stay and having supportive structures, being able to eat, drink and socialise as a normal person. The fall of the Islamic State group in Syria will not put an end to radicalisation and extremist views. Experts in this area have said governments need to focus now on preventing more people from being radicalised if they want to protect their citizens from attacks in their own countries. The Department of Justice acknowledged that monitoring and prosecuting those who commit terrorist offences is not enough to prevent radicalisation in the future. “The vital work carried out by our policing and security authorities must be complemented by strong, long-term measures to avoid an environment conducive to the social exclusion and polarisation that might lead to radicalisation and violent extremism,” a spokesperson told TheJournal.ie. Ireland’s National Migrant Integration Strategy 2017-2020 acknowledges radicalisation as one of the risks associated with poor or failed integration. The department said the actions that public authorities have committed to carry out under the integration strategy are intended to support the full participation of migrants and their children in Irish society. Email “The Explainer: Islamic State has been defeated in Syria. What happens if members return to Ireland?”. Feedback on “The Explainer: Islamic State has been defeated in Syria. What happens if members return to Ireland?”.